Regular readers may have noticed a little bit of partisan bias creeping into posts. There is some historical basis for this bias. Meet my great (× lots) uncle. 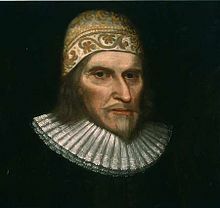 Sir Humphrey Chetham, High Sheriff of Lancashire and Parliament's General Treasurer of Lancashire. As he approached his death he feared the state would take his wealth, so set up a bluecoats school (now a posh music school), a library and a hospital.